Closeness to the national capita and increasing infrastructural activities and establishment of several businesses in the city have changed the real estate scenario of Jaipur. The article sheds light on the foremost reason for booming capital values in the city, which is ongoing real estate development in Jaipur. Read on to explore! Jaipur has been the latest choice for the investors who look forward to invest in cities in proximity of the national capital. With the rapid infrastructural activities in and around the city, such as construction of wide roads, road links, flyovers and foot over bridges, Jaipur is all set to witnesses the highest ever demands for properties. Government is also concerned about the renovation of the older residential colonies, make more plots available for agriculture, and improve the already available facilities. Such factors have also determined the fate of real estate industry of the city. As of now, Jaipur realty segment has witnessed some slow growth. However, in the last fiscal year 2012-2013, the rates were improved by 8-10%, while some of the posh localities of Jaipur, like Civil Lines, Vaishali Nagar, Subhash Marg and Ajmer Road displayed a comparatively higher growth rate of 15%. There has been surging demands for the residential properties in the city, which led many developers and builders to come up with their world-class residential projects. The process of these new projects is 5-7% higher than the current market prices; still they are selling like hot cakes owing to the specifications they offer. The market analysts are expecting the year 2013 to bring in higher prices of the properties by more than 20%. Some of the developing localities such as Sanganer Road and Sikar Road are the new corridors for growth, and have been the favorite destinations for the launch of housing projects. As compared to other Tier 2 cities like Bhopal, Lucknow, Nagpur, Surat and others, Jaipur has witnessed the maximum number of projects by the most renowned developers. Among the newly launched properties, most of them include multistoried buildings. The increased demand of such properties has certainly increased the loads on the buyers’ pockets. Besides, Jaipur is also developed as an important business destination, with the establishment of numerous businesses such as IT companies, industries as well as other educational institutions. The 265 KM long Delhi-Jaipur Expressway, which will occupy over 14,000 hectares, will bring revolution in the real estate segment of Jaipur. There are plans to introduce four new residential townships in localities near the upcoming expressway. Apart from this, the increased commercial activities in different localities of Jaipur have catalyzed the increase in capital values in Jaipur. 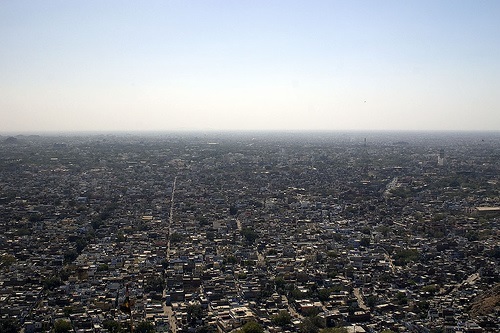 The Jaipur Development Authority (JDA) has launched a Master Plan 2025 to develop the real estate and infrastructure of the city. Other initiatives by the government, which have boosted the real estate values in Jaipur, are establishment of Special Economic Zones (SEZs), IT parks, Biotech and business parks, automobile industries and others. If the market watchers are to be believed, Jaipur is witnessing an ever-increasing demand for residential and commercial properties, and such a demand will keep on increasing in the upcoming years as well. It is the high time that the interested buyers can put in their money in the Jaipur real estate, before the prices start touching the sky!